« An Exclusive Right to Publish the California Style Manual? On September 1, 2017 the Office of the Law Revision Counsel, U.S. House of Representatives (OLRC), released a Title 34 of the U.S. Code. It contains no new law. All of Title 34’s provisions had been filed elsewhere in the Code, a fair number of them in the form of notes. The editors of the official code simply gathered the growing number of statutes dealing with “crime control and law enforcement” and organized them into this new location. The results are to be found at the Law Revision Counsel’s online edition. The new title is also available in the constantly updated online editions of the U.S. Code offered by LexisNexis, Westlaw, and Cornell’s Legal Information Institute (LII). In dramatic form this poses the question: How should one think about and cite to a provision of the U.S. Code or any of its state counterparts? Is it appropriate to use the new code architecture and cite a 2001 law authorizing the Justice Department to develop and support computer forensic laboratories as “34 U.S.C. § 30102”? (It was previously stashed in a note to 28 U.S.C. § 509.) If not now, when will it be? Five days earlier Pub. L. No. 115-50 amended Section 3 of the DNA Analysis Backlog Elimination Act of 2000, which had been codified by the Law Revision Counsel in Title 42, one of the non-positive law titles, as 42 U.C.C. § 14135a. With the establishment of Title 34, however, that section including the amendment moved to 34 U.S.C. § 40702. These changes were swiftly incorporated by the Office of Law Revision Counsel into its online version of the Code. (See its pages for 38 U.S.C. § 5103A and 34 U.S.C. § 40702.) Following standard practice, 38 U.S.C. § 5103A contains notice of the delayed effective date of the 2017 amendments in an appended note. From the OLRC site the titles, as revised, were picked up and incorporated immediately into the federal statutory compilations maintained by the major online legal information providers. (See, e.g., the LII’s versions of 38 U.S.C. § 5103A and 34 U.S.C. § 40702.) The OLRC offers bulk downloads in a range of formats (XML, XHTML, PCC, and PDF) to facilitate this rapid republication. The compilation maintained by the Office of the Law Revision Counsel (OLRC) and available online to both the general public and law publishers is the ultimate source for a set of books put out by the Government Publishing Office (GPO). Every six years the OLRC publishes and the GPO prints a fresh edition. The next edition to appear will carry a 2018 date, but it will not be produced and delivered until well into 2019 and 2020. In between editions there are annual supplemental volumes. They cumulate all changes made up to their cutoff date. The changes noted above will be contained in Supplement V to the 2012 edition of the code likely to be available in late 2018. Volumes and the annual supplements are produced sequentially so that titles with lower numbers and supplements to them appear in print sooner than, say, Titles 34, 38, or 42. As the print volumes are produced an electronic replica in PDF is placed, with authentication at the GPO website, in its FDsys (Federal Digital System) collection. Unlike their print counterparts, these files do not separate statutory text and notes into core volume and cumulative supplement. When the 2017 version of Title 38 appears at the FDsys site in late 2018 it will contain the full title as amended through the beginning of the year. III. Ought One to Cite to the Virtual or Generic United States Code? A. What Do the Leading Manuals Say? Federal statutes are cited either to the official print version of the United States Code (preferred, although it is rarely up to date …) or to the authenticated online version of the code in the Government Publishing Office’s Federal Digital System (“FDsys”)…. Cite an authenticated federal statute in FDsys the same way you cite it in print. 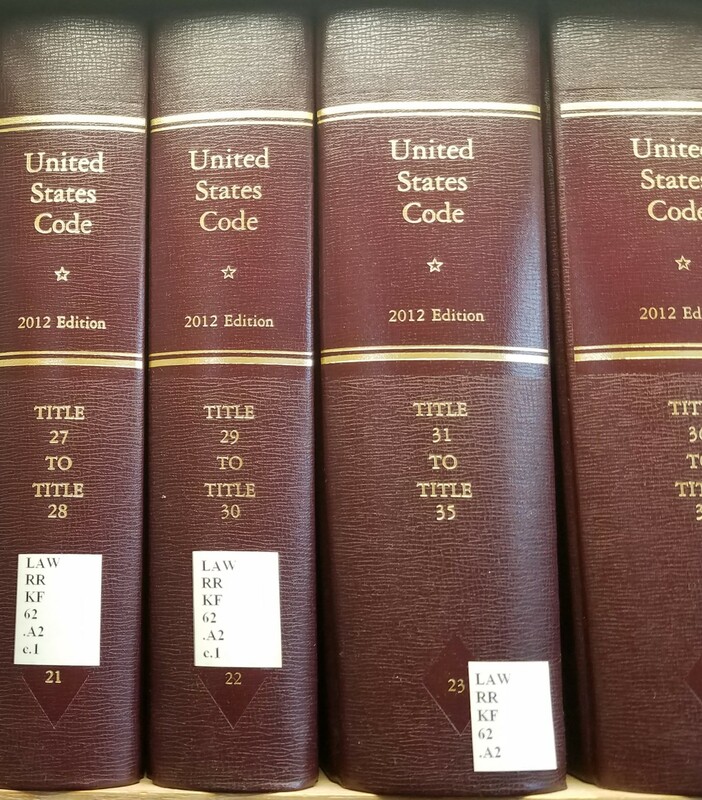 Like The Bluebook, which it essentially mimics on this point and most others, the ALWD guide appears to forbid citation to any of the revised portions of the Code noted above in the format “__ U.S.C. § __” until they have been published by the government in print or the authenticated digital replica. In the interim, for new law, citations to print session laws (or presumably their digital counterparts) are preferred. For a revised packaging of prior law, such as the new Title 34, guidance is less clear. Neither manual has adjusted to the availability of a continuously updated version of the code directly from the public body responsible for its publication. B. What According to Prevailing Professional Usage Does a “U.S.C.” Citation Represent? Does the citation of “17 U.S.C. § 102(b)” as the source for that passage represent that I reviewed its text in the GPO print publication or on FDsys? Both the Bluebook and ALWD Guide appear to say so. (Had I used Westlaw as my source they would have the cite read “17 U.S.C.A. § 102(b)”.) My intention and, I would argue, the widely understood meaning of the form of my citation was only to identify the location of the quoted passage in any of the many reliable, up-to-date versions of the Code. In addition to their attachment to print the two academic citation manuals reflect the continuing strong influence of Thomson Reuters and Reed Elsevier. Both manuals allow citation to those companies branded versions of the United States Code (U.S.C.A. and U.S.C.S.) as a fallback. The ALWD Guide to Legal Citation explicitly places them ahead of named commercial alternatives (including Bloomberg Law and Fastcase) and ignores the leading noncommercial source (LII). On what grounds? Revealingly neither mentions the OLRC’s online version of the code on which all others are based. Long ago when the only statutory compilations were those published in print, alternatives could be counted on a few fingers, and publication lag was substantial and varied among them, a requirement that a statutory citation reveal which version the writer had relied upon was defensible. No longer. In 2017 “U.S.C.” amounts to a generic designation, almost certainly employed by the reader to find the cited provision not in the GPO book but in some online database, very likely one different from that used by the writer. Federal judges whose opinions reveal their reliance on Westlaw by the prevalence of “WL” citations to “unpublished” cases cite the Code generically. A subscriber to Bloomberg Law who takes advantage of its “copy with citation” feature receives that citation in generic format, “__ U.S.C. § __”. However, a Westlaw subscriber using that service’s “Copy with Reference” feature is furnished a “U.S.C.A.” citation, and “advanced copy” on Lexis cites the same section to “USCS”. Because of such “citation assistance” and the durability of citation habits forged in the print era, citations to those two commercial compilations still appear occasionally in briefs and judicial opinions. Rarely are they used selectively, i.e., limited to provisions not yet available in the print United States Code. Typically, a judge or lawyer who cites to U.S.C.A. or USCS today does so throughout a brief or opinion. See, e.g., HSP v. JK, 223 N.J. 196 (2015), Bank of America, NA v. Camire, 2017 ME 20. This entry was posted on Monday, December 4th, 2017 at 8:42 pm and is filed under ALWD, Bluebook, Federal, Official, Statutes. You can follow any responses to this entry through the RSS 2.0 feed. Both comments and pings are currently closed.